As a seasonal chill enters the air, thoughts turn to enjoying a nice fire in the fireplace. No fireplace? GFRC makes a wonderful fireplace and mantel combination for any building. Fireplaces have two functions: keep the fire safely contained and look nice. Fireplaces made of GFRC perform both functions admirably. Because GFRC is fire resistant, it makes a safe material for the chimney surround. Concrete can crack and flake away at the temperatures found in a typical fire, but not GFRC. It stays together and performs its job. GFRC looks nice, too. Since it is cast, Stromberg GFRC can be molded into practically any shape you want. It can mimic terra cotta or stone fireplace surrounds at a fraction of the cost. Or, if you prefer, the material can be made in a paint ready surface so that it fits into the color scheme of your room. GFRC can even be tinted so no painting is necessary. To begin your fireplace surround project, simply decide how you want this important part of the room to look. If you have an architectural drawing, or CAD file, we can design the mold from that. If all you have is a rough sketch, or just an idea in your head, we will work with you to bring that design to life. In any case, we work very hard to make exactly the fireplace surround you envision. Once made, Stromberg GFRC can install your vision or deliver it to your contractor. One of the many of benefits of GFRC is that it is not only resistant to extreme heat, it remains tough even at high temperatures. Fireplaces, naturally, can get extremely hot, and this extreme heat can cause some materials to become brittle or fragile, making them susceptible to accidental impacts. 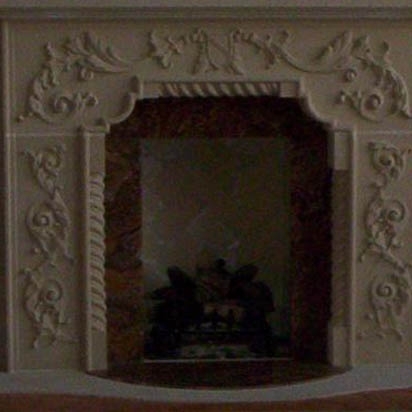 Fortunately, in addition to being completely fireproof, GFRC is resilient at any temperature, and therefore it is perfect for fireplaces and fireplace mantles. Ready to go to work? For more information and assistance with your design challenge, please call us at (903) 454-0904 today or email us at info@strombergarchitectural.com.